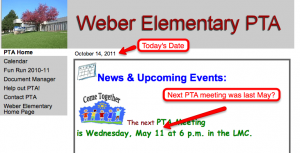 Home » Ask Matt » Why is it important to have a great PTA Website? If you are a PTA or PTO or PTSA in todays modern world and do not have a website, you are missing out. Every business and non-profit out there today has a website and you should too. Heck, even the Laundry Mats have websites now. It doesn’t matter if you are a huge PTA or a tiny PTA, a website is a critical piece of the equation these days. At Digital PTO we believe in the idea that every PTA/PTO should have a website so strongly, we provide websites at no charge for any PTA or PTO (or other Parent Group!) out there. Before Digital PTO launched, we spoke to countless schools that said a website was not in the cards because they were too expensive. Well, now there are no more excuses. PTA websites are free. And will always be free, forever! OK, so a PTA Website is Free. So What? I have personally spoken to a number of schools that not only didn’t have a website, but also could not understand WHY a website was even necessary. They have explained to me that very few people in their community are online. They have explained that no one on their PTA board knows how to use a website. They have explained to me that they (as the board member) do not use the web. And so on. All of those claims may be completely accurate, but my response is always the same. To make things even better, the computer era is not coming to an end anytime soon :). Every year more and more families are getting online, using email and creating a digital world for their needs and daily life. It’s a fact, the number of families in your community that have access to online content is growing annually, and it’s not going to stop any time soon. You can always wait to start catering toward these digital families, but keep in mind that for the most part, the families that have computers and smart phones also potentially have some money that they would be willing to donate to the PTA. Or Time. Or both. Don’t think that your PTA doesn’t need a website simply because of demographics or lack of computers in the community. It’s just not true. You need a website. At least if you want to be successful as a PTA. OK. My PTA Needs a Website. Now What? Once you log into your website you will see that we have already populated it with some of the critical pages that you will want to include on your PTA website. Those pages include the Calendar, an Info (About) Page, a Contact Us page, a Volunteer page and a Join the PTA page. In our opinion, these are the most important pages to include on your PTA website, but are certainly not all you should include. What Information should our PTA Provide Online? As I mentioned previously, there are a few critical pages that every PTA should have on their website, but there are a lot of additional pages that can be added to your website as well. Let’s start with the pre-built pages first and then delve into some more advanced options. Calendar: There are a lot of important things that should be included on your PTA website, but some sort of Calendar or list of events is toward the top for sure. It is important to have a location online that your families can visit to get a quick view of what’s going on at the school and with the PTA. Our Premium Members have access to two different Events Calendars (depending on their plan) that make adding new events a breeze, but even our free plan members should create some sort of list of upcoming events if nothing else. This is not the last time you are going to hear me say this, but be sure to UPDATE your website so that the data is current. There is nothing more discouraging than seeing information about a meeting that took place 5 months earlier (see example below). Keep your website updated! 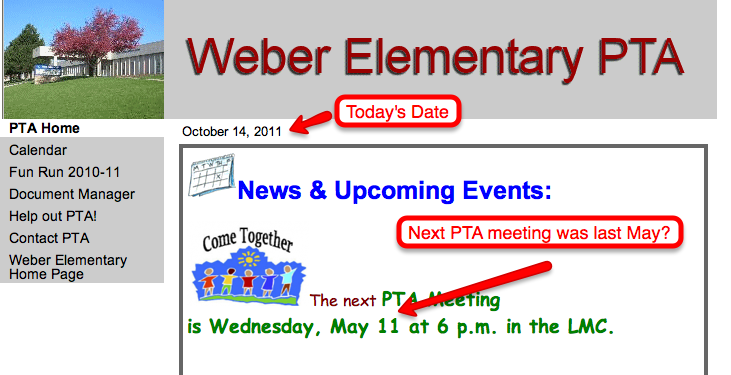 Notice this "Pre Digital PTO" school has not updated their website since last May. This will be much easier with their new Digital PTO website. Keeping your website updated is critical, but I’ll get into that more at a later time. As you can see from the website above, they have not updated anything since last year, so this is not an effective example of a PTA website. Not to worry though, Weber Elementary is now a Digital PTO member, so this website will be updated in the next few weeks! The Info Page: An information page about your PTA is another important element for your PTA website. At the very minimum, this page should explain what your PTA does and who your PTA is. Schools with strong online presences will add additional pages (which I will get into later) to take this to another level, but at the very minimum one of your schools families should be able to come to your website and at least understand why your PTA/PTO is doing what you are doing and also who you are. Personally, I think that the “Info Page” is where most PTAs fall short in their success. And it’s not simply the Info Page, it’s about marketing your PTA. Think of your PTA as a business in your neighborhood. It’s important to market your PTA so your community knows WHY it should support it. If your PTA is quiet and doesn’t promote itself, you are going to have a much harder time raising funds and finding volunteers than you would if your community was well informed. Would you spend money at a business you know nothing about and have never heard of? Probably not. The same holds true for your PTA. Be proud of your PTA and promote it! Digital PTO was founded on a single statement: A Connected PTA is a Successful PTA. Promote your PTA as much as you can, without promotion, your PTA is not tapping into its’ full potential! More on this topic later.. The Contact Us Page: I know it sounds simple, but contact information is really important to provide to your community. It is important to set up some sort of method for communication with your PTA. Whether it is an email address of a board member, or an email address set up specifically for your PTA, you must allow people the opportunity to contact your group. More advanced PTAs will use the Premium Forms available with Digital PTO, but even providing a single email address is fine. A Contact the PTA page allows the community to be in touch with you. I’ll warn you in advance that 95% of all emails you receive will be either praise or criticism. It is the nature of humanity. Allow people to express their feelings, and some of them will. :) Critical or in favor though, all of the communities feedback is important. The Volunteer Page: As much as we all wish that the Volunteer page was the most visited page on your website, it won’t be, but it is still a critically important page to include. While not the most visited page on your website, the families that do visit this page are worth their weight in gold. Our Premium Members have access to a nice Volunteer form, but even free website can include some information and a way to contact you. Volunteering for the PTA is cause for anxiety for many of your families, so taking the opportunity to explain the different volunteer opportunities and time commitments is a great way to ease a new family into the PTA without making them feel like they need to donate 50 hours a month. The Volunteer page is your recruiting page, so be sure to recruit well. Encourage participation, make it easy and stay organized. The Join the PTA Page: Two different groups of people will visit your Join the PTA page. Curious families and families that are ready to support you. Be sure to cater to both. If you are a Premium Plan member, you have access to one or both of our Online Family Registration forms as well. Premium Plan Members have access to our basic Family Registration Form that collects family registration information in a database and allows you (as the admin) to download that data in bulk for reporting, directories, etc. Our Premium Plus Members have access to another Family Registration Form that adds the ability to collect payments in addition to integration with popular mailing list services like Mail Chimp. Both forms serve the same purpose though, and that purpose is to collect information. Your Join the PTA page replaces the clipboard and forms of yesterday. Even free members should have some sort of information on their Join page. We would also advise our free members to upload a copy of your registration form and link to it from the Join the PTA page so that your visitors can download your registration form on their own. Don’t forget: It is important to tell people why it is important to join. As a card carrying PTA/PTO member, you know why it is important to join the parent group and get involved, but the majority of your school has no idea why they should join. It is your job to convince them. We have found that most families respond best to concrete examples and goals. Instead of listing “Fundraising Events” or “Help the School” be more specific. “We raise money as a PTA with your donations and our goal this fall is to raise $15,000 so that we can continue to give the school amazing experiences like: the carnival, fun fridays, etc, etc” By providing specific information potential families understand immediately what you do, why you are doing it and what your goal is. That is a pretty powerful sentence. Be sure to let families know about any additional benefits you offer as a PTA as well. Discounts on Enrichment classes to PTA members? Inclusion and a copy of the school phone book? Free hotdog at the school carnival? Donate now so you don’t have to do “door to door” sales later this year? I think you catch my drift. Approach the page like you don’t know why you should join the PTA and write it from that Point of View. I can go on for days about promotion and technique regarding the Join the PTA page, but I will save those for separate posts. I will continue writing on this topic in the near future and will start to cover deeper topics like Promoting your PTA Online, and working with Business Sponsors in addition to a number of other topics. After 4 years of researching the best and most effective ways to get PTAs online with websites, I am excited to continue to share what I have learned with you. If you have any specific questions, feel free to leave a comment in the comments section, we would love to hear from you. «A new theme has arrived at Digital PTO and it is amazing.